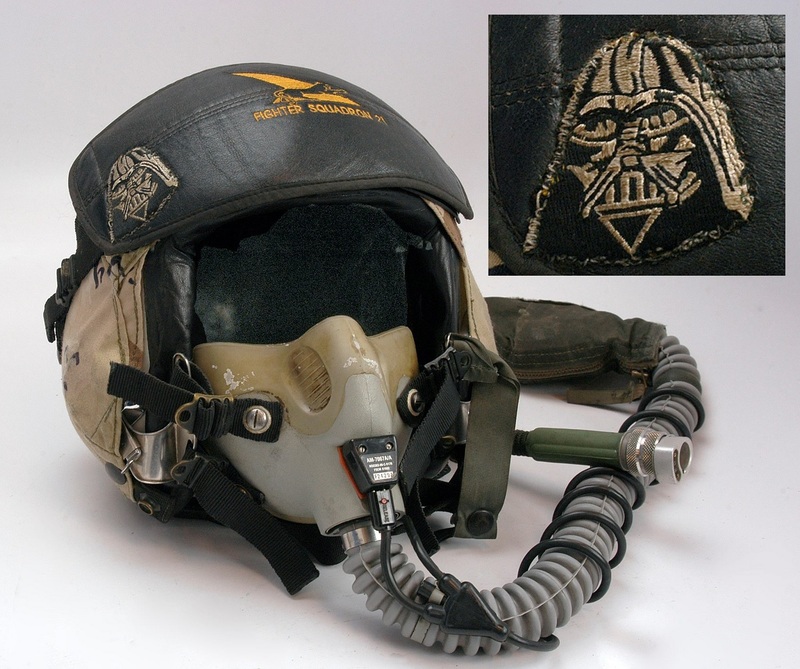 May 4 was Star Wars Day and even if we’re two days late in celebrating this very special event here’s something cool for you: the picture of the flight helmet worn by then Commander Dan “Darth” Cain during his service in Fighter Squadron (VF) 21 in 1990. There is no doubt that the force was with Darth each time he was wearing this helmet. In 1990 VF-21 “Freelancers” was equipped with the iconic F-14A Tomcat and was embarked on USS Independence (CV-62). On Aug. 5, 1990 the carrier was the first U.S. Navy flattop to arrive on station in the Persian Gulf just three days after Iraq invasion of Kuwait and VF-21 flew Combat Air Patrol (CAP) missions during subsequent Operation Desert Shield. However, USS Independence was relieved on station by the USS Ranger (CV-61) and USS Midway (CV-41) at the onset of Operation Desert Storm. Nevertheless VF-21 returned aboard USS Independence to establish Operation Southern Watch immediately after Desert Storm. In Aug. 1991 USS Independence took over the role of USS Midway as the only carrier home ported outside the USA, at Yokosuka, Japan. During this change the squadron stayed with the same carrier but moved air wings, from CVW-14 to CVW-5. This was, because the Midway air wing had been without F-14s, as the older ship could not accommodate the F-14’s size and weight. In Mar. 1996 during the Third Taiwan Strait Crisis USS Independence and USS Nimitz were involved in operations to demonstrate U.S. resolve in support of Taiwan. VF-21 returned from deployment on board the Independence in late 1995. This was Freelancers last at sea period and the squadron was soon after disestablished, the official ceremony was on the Jan. 31, 1996. During the whole VF-21’s F-14 career, the unit has been partnered by VF-154.